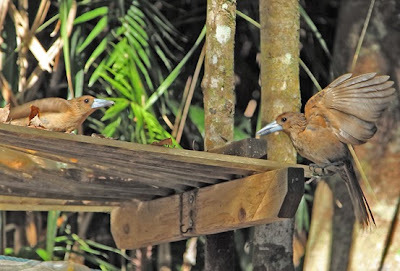 Not all insects you see in rainforests are stunning but here are a couple that are really excetional. Zeuzera aeglospila (Turner) is a member of the family Cossidae. 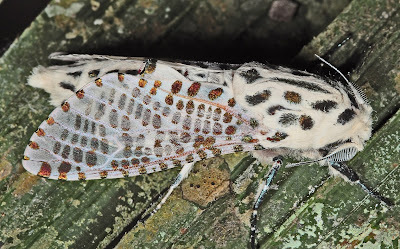 Cossid are called Carpenter Moths because the larvae live in dead wood, feeding and reducing the wood to phrass that provides nutrients to plants and other organisms. 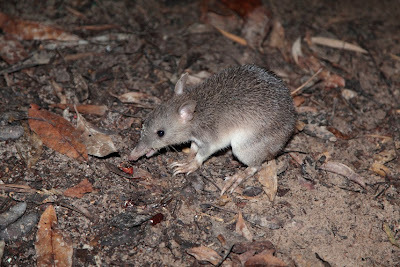 Z. aeglospila is a Queensland species but another member of the genus occurs in India and the Philippines feeds on Cinnamon trees and the genus Litsea. Nothing is known of the habits of the Australian species but we have Litsea on our property. Many of the Carpenter Moths are grey or brown, not very colourful. But when you see this species up close it has a remarkable array of colours and iridescence. 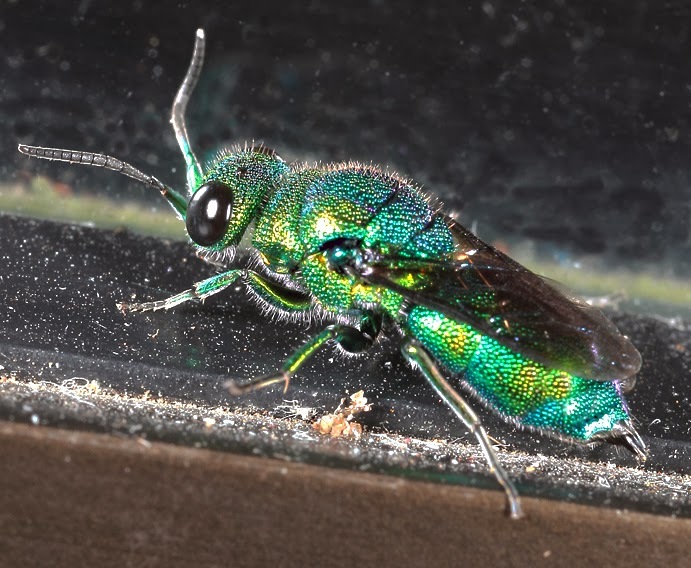 Another gem is the Cuckoo Wasp. There are many species spread throughout the world. As a rule they are a challenge to the photographer because they seem like perpetual motion machines. You often see them examining holes in wooden buildings in search of potential hosts. This little fellow flew into the house and landed on the window sill where it gradually came to rest. Cuckoo Wasps (family Chrysididae) are usually under 20 mm in length and have a tough integument. The punctured sculpturing is a characteristic of the family and probably aids in preventing them from being stung. 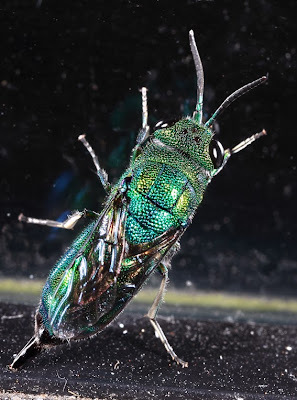 Most are parasites of other wasps ands when the tables are turned, they can roll up into a ball and become almost impervious to the stings of their hosts. A few species are parasites of moth larvae. It's that time of year again. 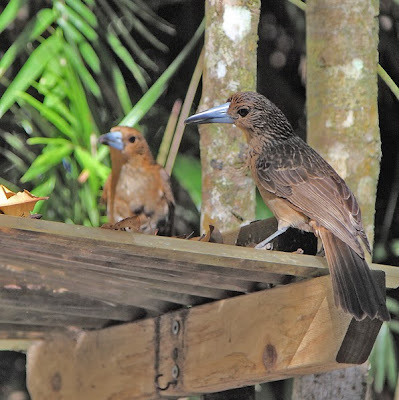 The Black Butcherbirds, Craticus quoyi, have fledged their young. This year there are two juveniles that will be raiding nests and creating havoc in the local animal community. These two have discovered that there are easy picking early in the morning at the light sheet. Large bitey long-horned beetles offer little resistance. The hooked tip of the bill is ideal for catching and holding prey. Unfortunately, their depredations don't end with insects. They are major predators of the young of Sunbirds. They await the time when the young birds fledge and they capture them on their first flight. Butcherbirds redeem themselves with their melodic and beautiful calls. 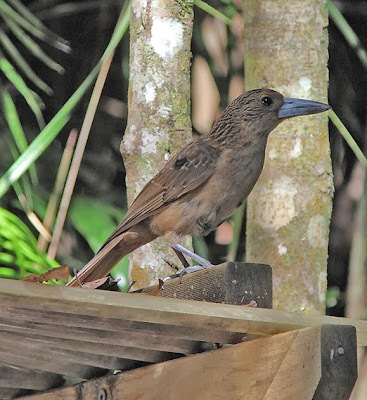 They are a wonderful feature of the fantastic down chorus in the rainforest and environs. 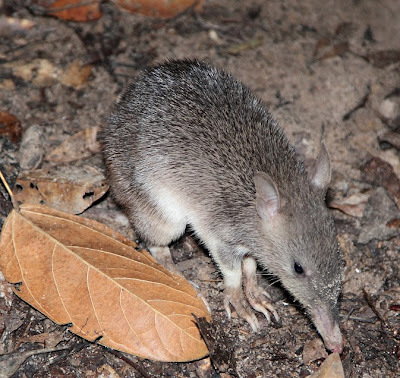 This species extends north to New Guinea. 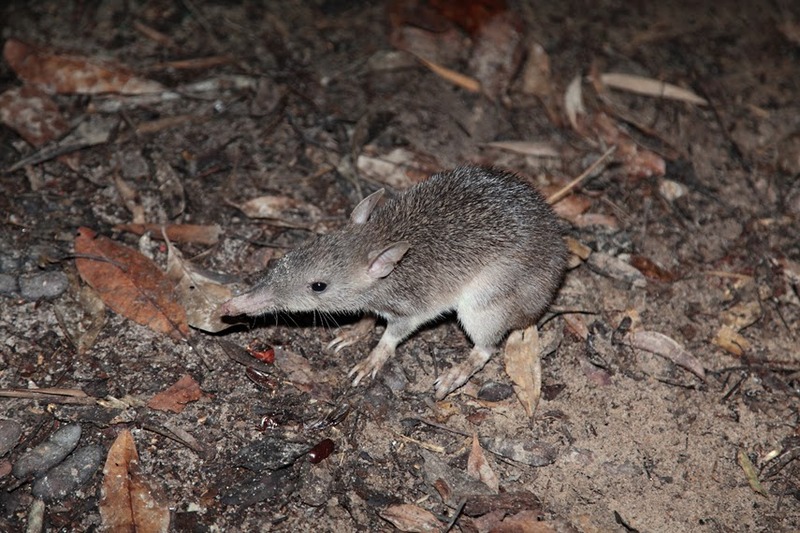 For the past couple of weeks this little Long-nosed Bandicoot, Perameles nasuta, has been a regular evening visitor to my lightsheet. It seems to be a juvenile because it is so small and generally unafraid. 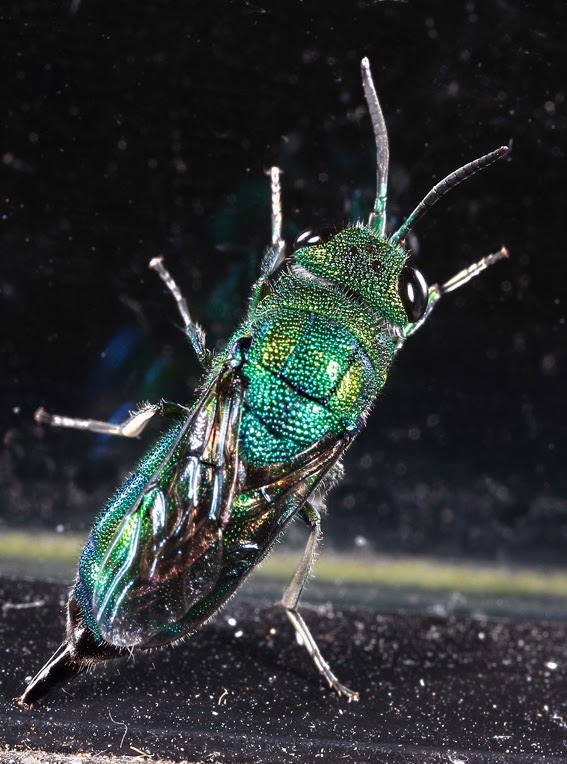 It crunches up beetles, moths and other insects that drop to the ground at night. 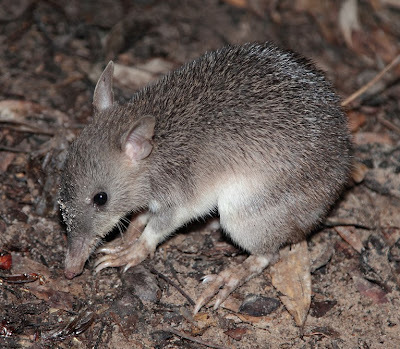 Bandicoots are nocturnal and are marsupials. Females have a small pouch that is directed towards the rear of the animal and produce young after a gestation period of only 12 days. 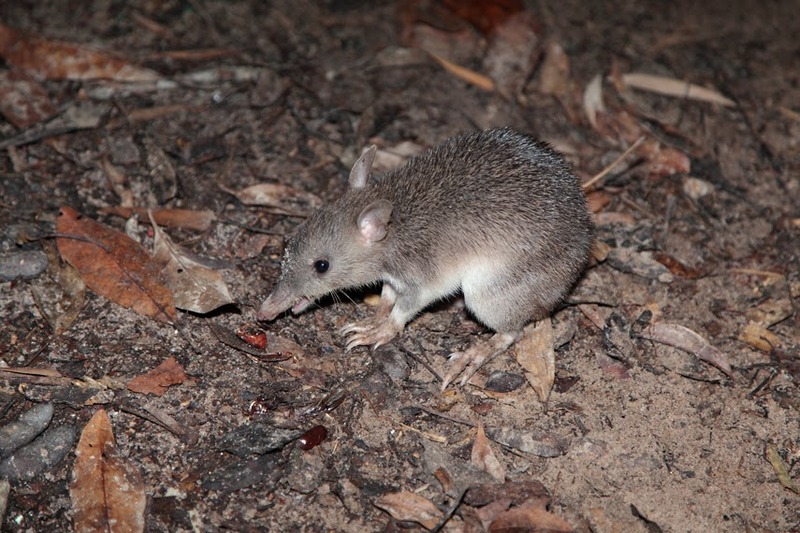 Newborn young are only 13 mm long and weigh 0.25 g. They grow rapidly and are weaned after 60 days. 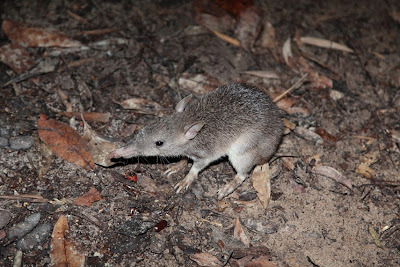 When not dining at entomological collecting sites, the bandicoots use their front feet to dig neat conical holes in woodlands and lawns to retrieve insects, worms etc. They are not very popular with gardeners and greens keepers. Unfortunately, they are popular with the local felines. Cats probably account for their demise in residential areas. We have a number of irresponsible neighbours that throw their cats out after dark. Hopefully the local pythons and paralytic ticks will read this a do something about the situation.